CULTURE: "Cancer, what risks? ", A book that advocates total withdrawal to reduce risk. CULTURE: "Cancer, what risks? ", A book that advocates total withdrawal to reduce risk. Is total weaning the solution to end tobacco? If we obviously have the habit of proposing the e-cigarette as a solution, some voices are raised to propose other alternatives. 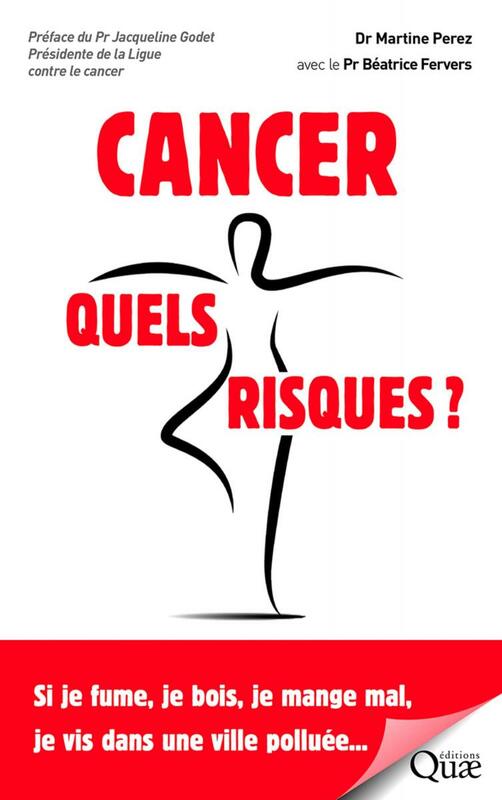 This is the case Dr. Martine Perez and Pr Béatrice Fervers who through the book « Cancer what risks? » published Quae editions prefer abstinence or total withdrawal to reduce risk effectively. "THE FINAL OBJECTIVE IS WELL ON THE DEFINITIVE STOP OF TOBACCO AND E-CIGARETTE"
In " Cancer what risks? Published by Quae Editions, Martine Perez and Beatrice Fervers describe under what circumstances certain behaviors favor the emergence of this scourge. So that you can get an idea here is an extract from the book currently sold at Amazon for 19,50 Euros. "The only way to reduce the risk of tobacco-related cancer, both for the smoker and his family, is total weaning. " Some countries have engaged in long-term tobacco control strategies, such as Australia or New Zealand, with interesting results, as the percentage of smokers in these countries has fallen below 15%. Public policies to sharply and sharply increase the price of the pack of cigarettes, to ban tobacco in all public places indoors and outdoors, and to impose the neutral package and the sale under the counter (packages are not more exposed), but also free smoking cessation aid or massive fines for tobacconists who sell tobacco to less than 18 years ... have helped to obtain these very favorable results on consumption which continues to decline. Political will is the only factor that will help to reduce smoking in France where 30% of adults continue to smoke regularly. But how to stop smoking? First, avoiding starting of course, because then, since it is an addictive product, it is very difficult to stop. Unfortunately, there is no method to stop smoking offering 100% chances of success. "First anti-smoking strategy: you can try to wean yourself. The strength of the will sometimes makes it possible. " Otherwise, the second step is to consult your GP. It has been shown that individual tobacco counseling, a ten-minute interview with a health professional who stimulates the will and demonstrates the value of weaning for health, multiplies by 1,4 the chances of success of the stop. Group therapies (cognitive-behavioral techniques) have also demonstrated their effectiveness, but not quite better than individual counseling. Nicotine substitutes in all their forms (gums, patches ...) multiply by 1,5 1,7 the chances of success of attempts to stop smoking. "The electronic cigarette is sometimes recommended by pulmonologists to stop smoking. According to the Inpes 2014 Health Barometer, a smoker who also uses an e-cigarette would reduce his consumption of tobacco, on average, nine cigarettes a day. But the ultimate goal is of course the final cessation of tobacco in all its forms and the electronic cigarette remains a second-best. " On the political side, it is shown that one of the most effective measures to encourage smokers to quit smoking is the so much criticized by tobacconists of tobacco prices. As part of the first cancer plan, between 2002 and 2004, the price of the best-selling package has gone from 3,6 to 5 euros. This significant taxation resulted in a drop in 33% cigarette sales between 2002 and 2004, and a drop in the number of smokers. For WHO, price increases are the most effective way to reduce consumption. An increase of 10% of the price paid by the consumer reduces sales by 4% and has an even greater impact on young people (- 8% of sales concerning them) and on people in precarious situations. Following : VAP'NEWS: The e-cigarette news of Thursday 17 January 2019. WEANING: The National Cancer Institute puts in ... With time, mentalities evolve and this is also the case for official organizations. The INCa (National Cancer Institute) recently released a video about tobacco and food.